It has been a strange summer to say the least. With the exception of a few hot days, Milan has been uncharacteristically cool and rainy, a somewhat welcome contrast to the sweat inducing sauna heat that usually engulfs this city in the summer time, making it virtually unlivable. A little more sunshine would be nice, but I’m not going to complain too much. As long as I have to stay in the city, I’m happy with cooler temperatures. I’m hoping for some sun and heat at the seaside in a few weeks though. Weather aside, summer is a wonderful season for fresh produce and fruits in particular. They keep us waiting all year long, but when they finally arrive, boy do they tantalize our taste buds. From peaches to nectarines, apricots to plums, cherries to berries and not to mention melons, summer fruits promise a sweetness unlike no other. They’re delicious and refreshing eaten alone, but equally lend themselves to raw or cooked preparations; blended, puréed, grilled, stewed, baked, and poached, in savory and sweet dishes alike. 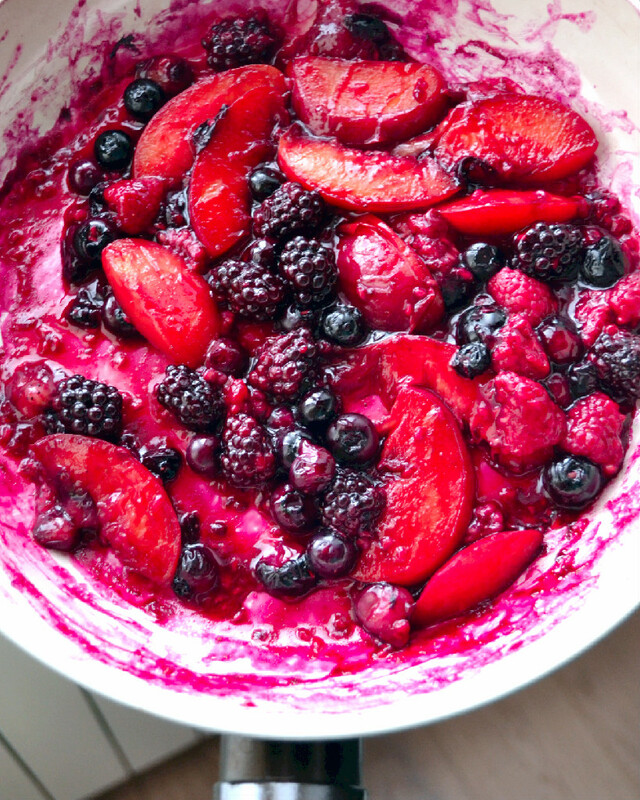 This here is an ode to summer fruits in all their glory. Namely nectarines, blueberries, raspberries and blackberries which are just now coming into their peak season; stewed and served atop a vegan sugar-free polenta cake, inspired by the Amore Polenta, a typical tea cake from the Lombardy region of Italy that gets its name from the use of cornmeal (or polenta) as it’s main ingredient. This refined sugar free, egg free, dairy free and nut free version, is an undoubtedly healthier take on the traditional recipe but it certainly does not compromise on taste and texture. The result is a light and fluffy cake, just as delicious bare with a cup of tea, as it is topped with stewed summer fruits. Recipes and Photography by Nissrine at Harmony à la Carte. Celebrate summer with stewed nectarines, blueberries, raspberries and blackberries atop this light and fluffy vegan and refined sugar-free polenta cake. Preheat oven to 180 C (350 F) and brush 4 individual size cake/tart molds with sunflower oil (or other oil of choice). Place molds on a cookie sheet and set aside. 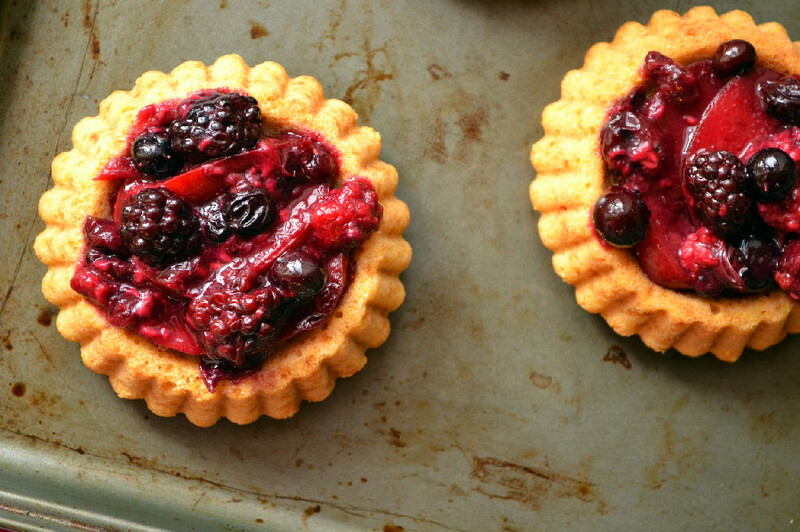 The molds used here are 10cm tart tins. In a large mixing bowl, combine polenta, baking soda and sea salt, then sift in flour and baking powder. In a separate mixing bowl, whisk together maple syrup, apple sauce, rice milk and sunflower oil. Pour wet ingredients into a well in the center of the dry ingredients and mix gently with a spatula until well combined without any lumps. Do not overmix. Divide batter equally among the 4 prepared molds and bake for approximately 20 minutes or until toothpick inserted in the center comes out clean. Meanwhile, add nectarine slices, water and maple syrup to a skillet or pan and stew over medium-low heat for about 10 minutes, flipping nectarines about half way through. Add berries on top of nectarines and let the mixture stew and caramalize for about 5 minutes. Gently stir with a spatula to prevent sticking. Remove from heat and set aside. 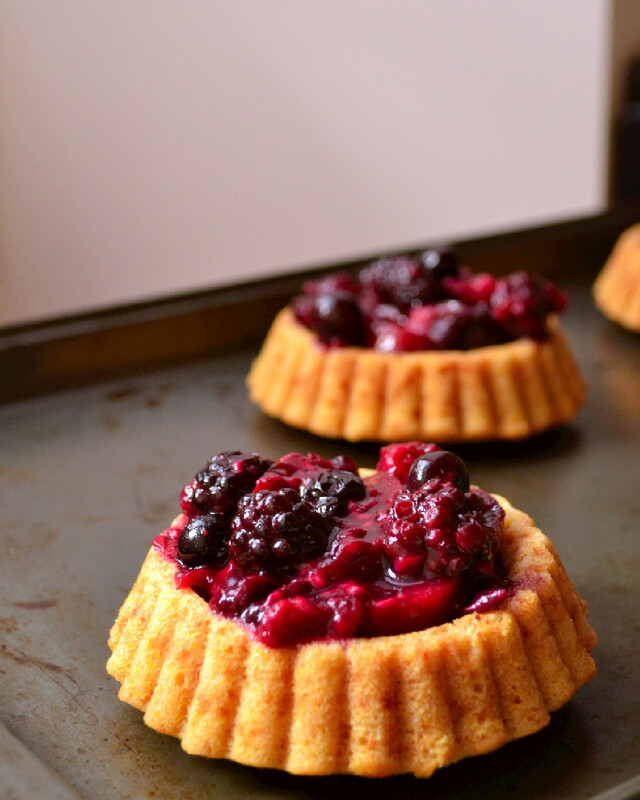 Remove mini cakes from the oven and let cool for about 10 minutes. Carefully flip the molds over to remove the cakes. If the mold are well greased, they will slide out effortlessly. Divide stewed fruit mixture evenly among the 4 cakes and serve warm. Serve with vanilla ice cream for an extra decadent treat, or enjoy the cakes bare with a cup of tea. Note: If you’re not serving them right away, store the polenta cakes in an airtight container at room temperature for up to 3 days. Then top with the warm fruit just before serving. these look like they would be perfect for a brunch dessert! pretty pictures! Thanks hun! Yes they make a perfect breakfast/brunch item. In fact we had them for breakfast this morning. this is a seriously good idea.. those polenta cakes look delicious with the stewed fruits, definitely craving one right now! Thank you Thalia! They’re really easy to make. Hi Jana, I’m so sorry I missed this comment. I just found it in my spam folder a few minutes ago. I’m not sure if you’ve already made them or not, but it’s cornmeal FOR polenta, meaning the kind of cornmeal that is used to make polenta. I’m always confused as to how it’s labelled in other countries because here in Italy they just label it “polenta” or “corn for polenta”. In any case it’s coarse cornmeal and not the fine powdery cornflour (and definitely not cornstarch) that you want to use. I hope this helps. Let me know how they turn out if you end up making them. I do know Audrey, I used to love those too. In fact I created these as a healthier homemade sub. I have plans for remaking these with custard filling and fresh fruit topping, just like the ones at the supermarket, but better.